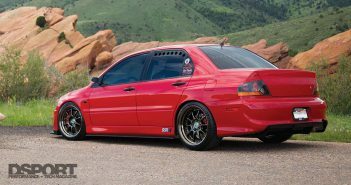 Trying to fill the shoes of what many believe to be the best four-cylinder production engine of all time is no easy task. Yet, this is exactly what the 4B11 was asked to do. 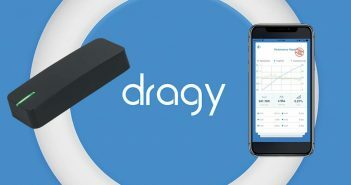 More modern by design, the 4B11 has its advantages and disadvantages compared to the 4G63. We decided to see just how good a 4B11 could be by engineering a Club DSPORT Reference Series edition. Our goal is to produce a 4B11 engine combination capable of delivering exceptional power output, efficiency and reliability. Once completed, we’ll put it to the test. If we are happy with the results, there may be another offering in the Club DSPORT performance engine lineup. While it may never earn the legendary status of its cast-iron predecessor, the 4B11 does incorporate some nice design features. The 4-bolt mains caps have much more material than a 6-bolt 4G63. 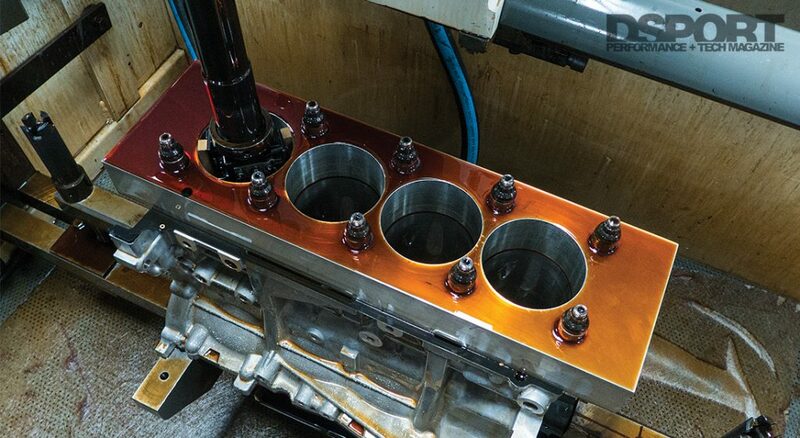 While there is not an integrated girdle or ladder structure like on the 7-bolt 4G63, the 4B11’s massive 4-bolt caps are likely on par in the strength department to the 2-bolt cap and girdle structure found in the 7-bolt 4G63. 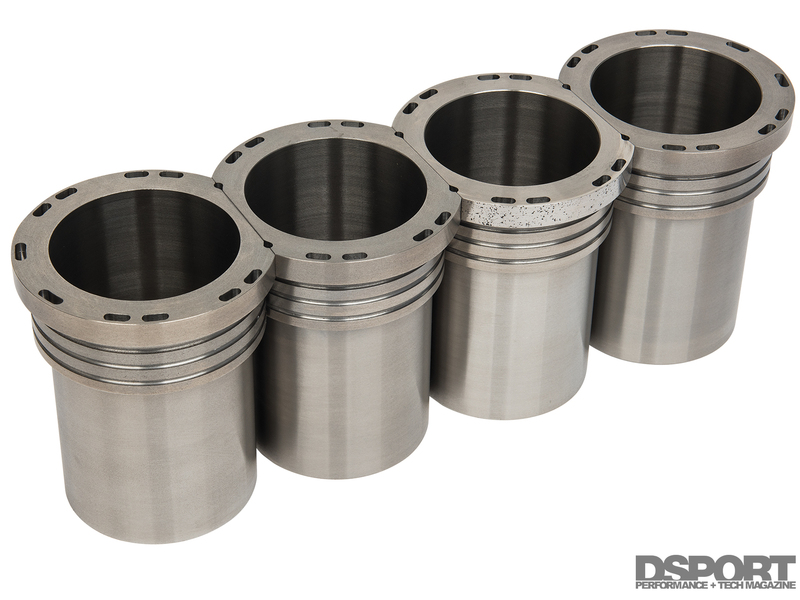 As with many aluminum blocks, the cast-in cylinder liners present the weak point when power is pushed. With the 4B11, a semi-closed design is used with the cylinders and deck. While this aids in supplying superior cooling to the cylinder, it reduces the section width at the top of the cylinder. This reduced section width can crack when cylinder pressure spikes when detonation occurs. 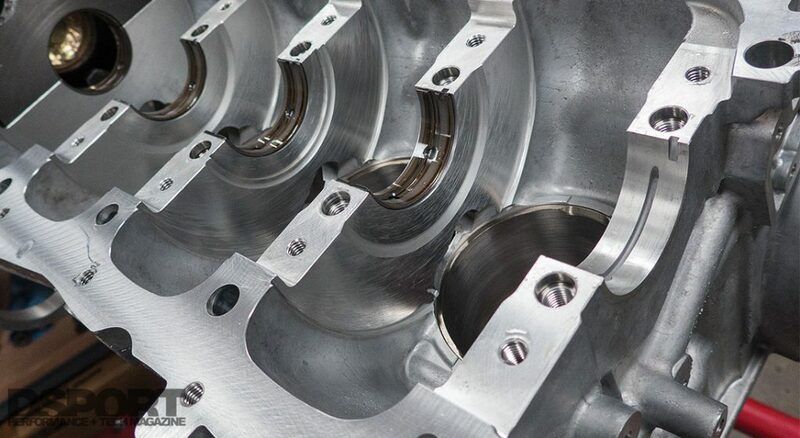 Precision boring and a smooth surface finish in the bores is critical to fitment when a press-fit type cylinder sleeve is being used. This 4-axis CNC performs all of the boring operations. To make a 4B11 engine block capable of supporting more than 500whp, a sleeving solution is needed. A number of options are available for the 4B11. There are dry, flanged dry, wet and “amphibian” solutions available. A dry sleeve gets its name because the outside of the sleeve never makes contact with coolant. A dry sleeve simply replaces an OEM sleeve which is first machined out of the block. Dry sleeves are made from superior ductile iron material and have thicker walls too. Some dry sleeves incorporate a flange at the top to provide a physical surface that aids in keeping the sleeve positioned in the engine. When higher power goals are the focus, most engine builders turn to a wet or amphibious type sleeve. These sleeves require the removal of the entire top portion of the factory cylinder. A wet sleeve often replaces the entire portion of the factory cylinder that’s exposed to coolant, whereas an amphibious sleeve is designed to retain a portion of the factory cylinder exposed to the coolant. In either case, both of these designs replace a good portion of the factory cast aluminum cylinder with a much thicker-wall ductile-iron cylinder. The strength improvement is generally many times what can be achieved with a dry sleeve. In our experience, both amphibious and wet sleeves will handle all the power that can be thrown at them if the block machining and installation of the sleeves was done properly. Since amphibious sleeves require a precision interference fit, you won’t be able to get away with sloppy machine work. This is one area where a wet sleeve is a bit more forgiving as the clearance between the outside of the sleeve and the block is less critical. The closed-deck amphibious sleeves from LA Sleeve are filled with custom CP Pistons featuring thermal barrier coatings and hard anodizing. In addition to adding strength, sleeving the 4B11 allows for a larger cylinder bore to be used. 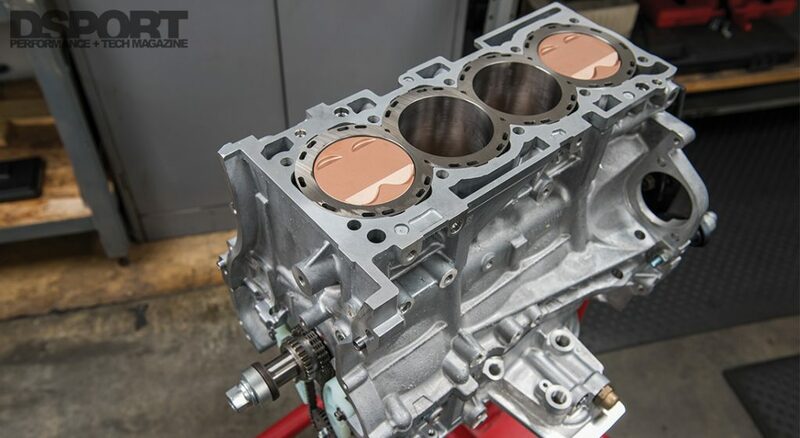 Since there is a good head gasket option with a 90mm bore (i.e. Cosworth), we opted to go 88mm on the bore for starters. This will allow the engine to be completely rebuilt at least three times in the future as an 88.5mm, 89.0mm and 89.5mm. There are a number of different types of sleeves available for the 4B11. These sleeves can allow bores up to 90mm and power handling beyond 1,000whp. Each design has its advantages. 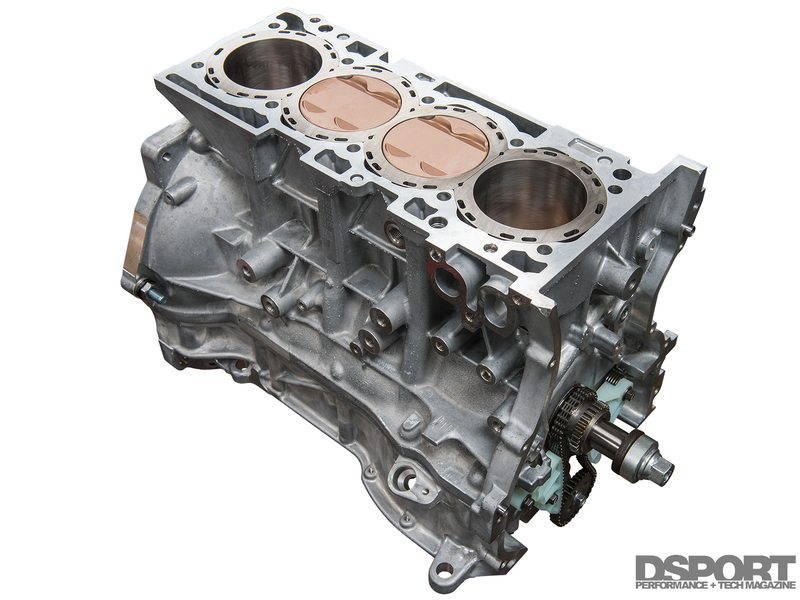 While upgrading from an 86mm to 88mm bore already takes the displacement up 4.9 percent (from 1,998.5cc to 2,092.5cc), increasing the stroke of the engine delivers a like increase in displacement. For the 4B11, a number of stroker crankshafts are available including 94mm, 96mm and 98mm. Since we wanted to still be able to spin the engine to a high redline, we opted for a Callies 94mm forged-steel option. 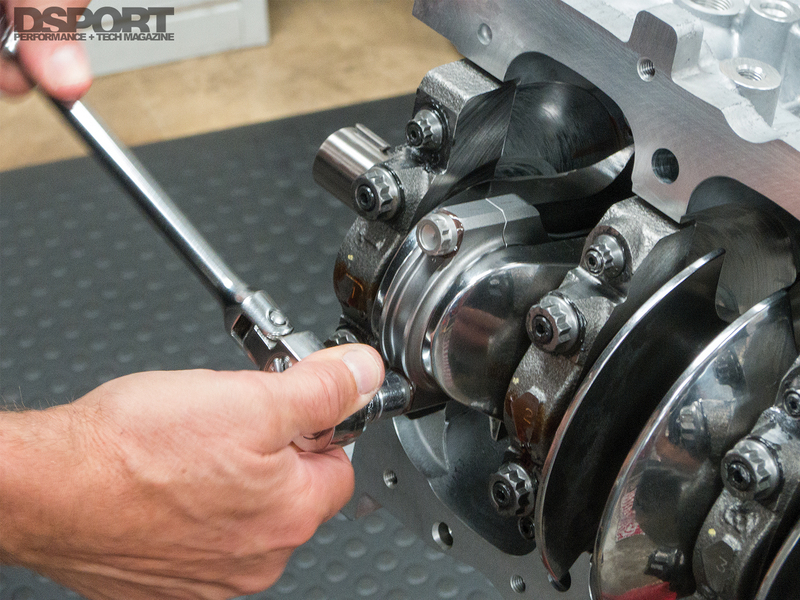 This is our first ever Club DSPORT build with a Callies crankshaft, but we are pleased with what we’ve seen so far. 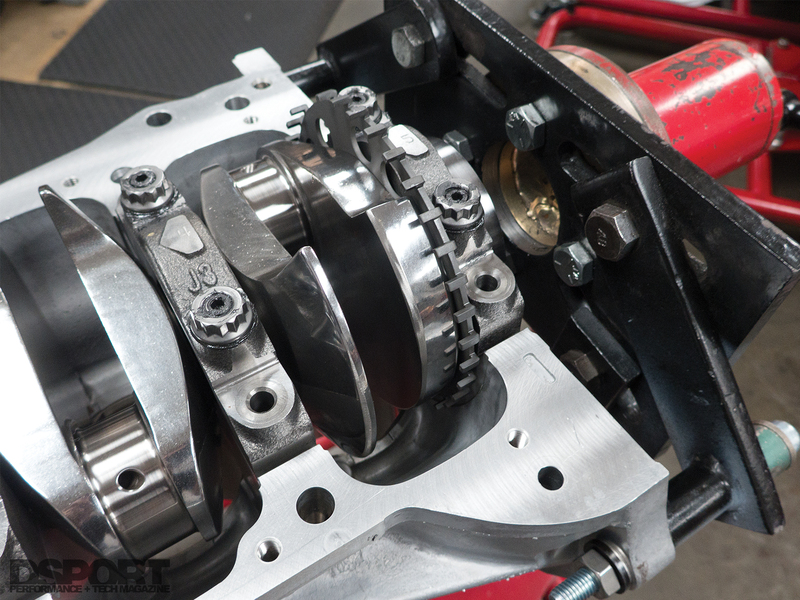 The cranks are finish machined and nitrided in the USA for exceptional quality control. This one was straight as could be and it also featured the Aeroshed option for increased performance and durability. Since the stroke was increased from 86mm to 94mm (a 9.3-percent increase), a like increase in displacement is achieved. Hence the combination of 88mm bore and 94mm stroke delivers a final displacement of 2.3 liters (2,287.2cc). Stroker engines seeking to run at high engine speeds need a piston and ring package up to the task. The thinner the rings and the tighter the ring grooves, the better as less ring flutter is likely to result at high RPMs. Keeping the piston as strong and rigid as possible while making it as light as possible is also a benefit for these applications. 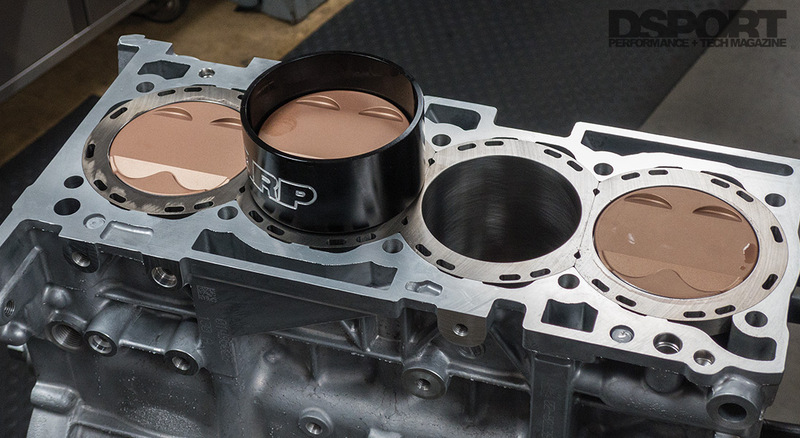 We opted to work with CP Pistons to build a custom set of pistons showcasing the latest technologies. A 1.0×1.2x2mm ring package with a PVD steel top ring fits into the anodized ring grooves of the internally milled and lightened piston. DLC pins provide a low-friction no wear surface that won’t scuff even if lubrication is limited. A flat-top design was chosen to maximize combustion efficiency and quench to reduce the likelihood of detonation. The 4B11’s 4-bolt main caps are held in place by ARP2000 alloy main studs from ARP. This shot was taken before the outer bolts were installed and torqued to spec. To make the connection between the Callies crankshaft and custom CP Pistons, we opted for the PRO-H connecting rods from Carrillo that feature the upgraded 3/8” CARR bolts. One big advantage of the CARR bolts is that they do not require replacement upon servicing the engine. The rods feature extensive design features which minimize weight and maximize strength. Since two bolted parts are only as good as the quality of fastener used between them, we opted for ARP main studs to be installed in the block before the main line boring operation. 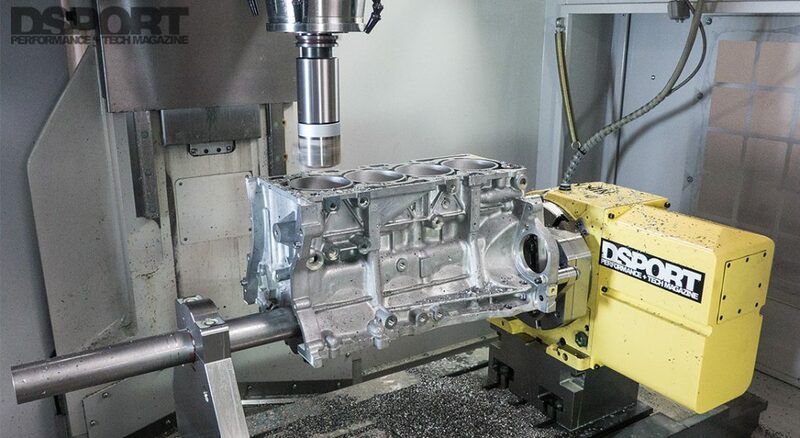 ARP CA625+ head studs were also used during the cylinder honing operation and will also be used upon assembly of the head to the block. To achieve the desired bearing oil clearance, we ended up mixing and matching ACL Race bearings of both the STD and STD-HX variety. 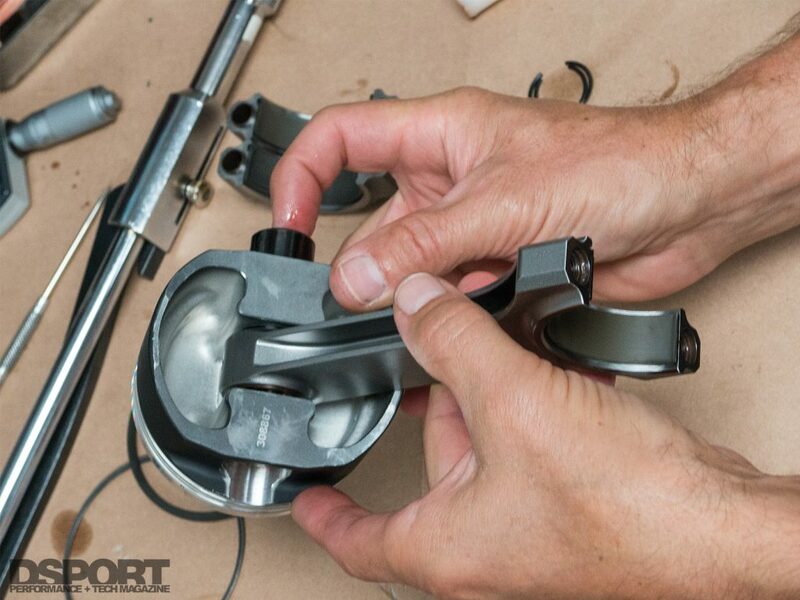 All of the machining and assembly was conducted in house at our Club DSPORT facility. 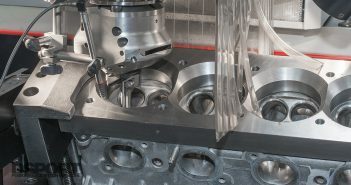 Machining operations included a CNC line boring, CNC Decking, CNC Boring, plateau honing of the cylinders with a torque plate and three-stage dynamic balancing. Trying to have your cake and eat it too. It’s the American dream. Designing and building a stroker combination that can deliver increased displacement without trading off RPM potential is no easy task. Fortunately, new technologies make old rules of thumb outdated. Just how well will our Club DSPORT Reference Series 4B11 performance? Just wait and see and we’ll have the top end combination covered in detail next month. Stay tuned.